After a week of making up bookmarks, wall-plates etc. 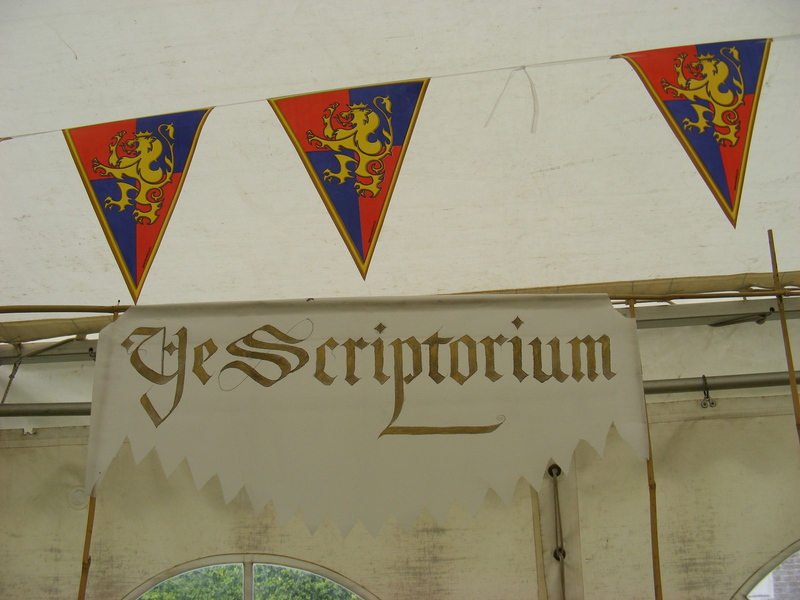 and framing of prints, we loaded the scriptorium into the car and headed off to wildest Medieval Dunstable. Only four miles down the road but eight hundred years on the time scale. We were greeted at the entrance of Priory House by one of what seemed to be a whole battalion of immaculately turned out Army Cadets. We were shown to our tent by Lisa the event organiser and, helped by half a dozen Cadets, unloaded everything into a marquee that had been erected onto the rain-soaked grass. 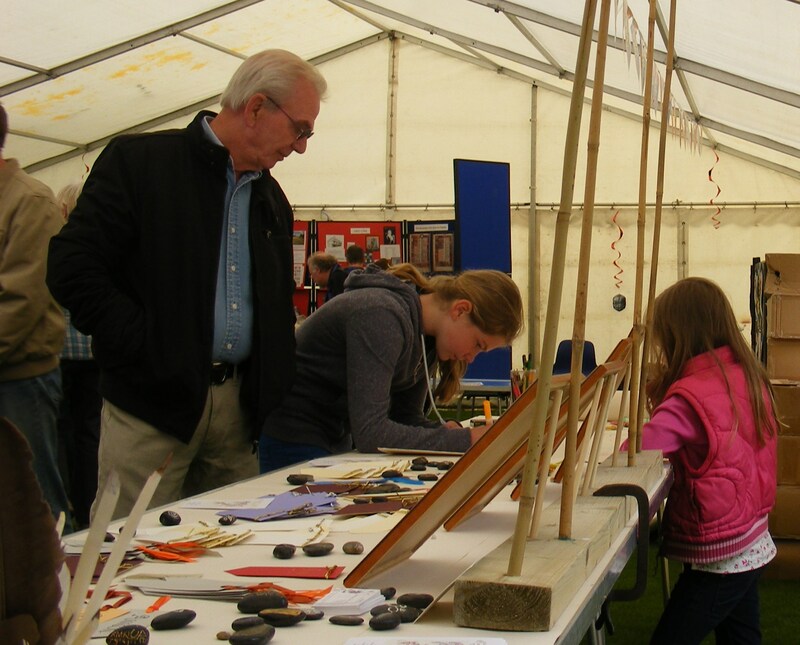 At that time, in the totally empty space which was to house us, The Bedfordshire and Luton Archives and Records Service, The Dunstable History Society and The Manshead Archaeological Society, were about six large, soaking wet tables. Three of these were quickly dried off for us by the cadets and placed in what I thought would be the prime spot. I left Gill to arrange the stall while I went off to park the car. 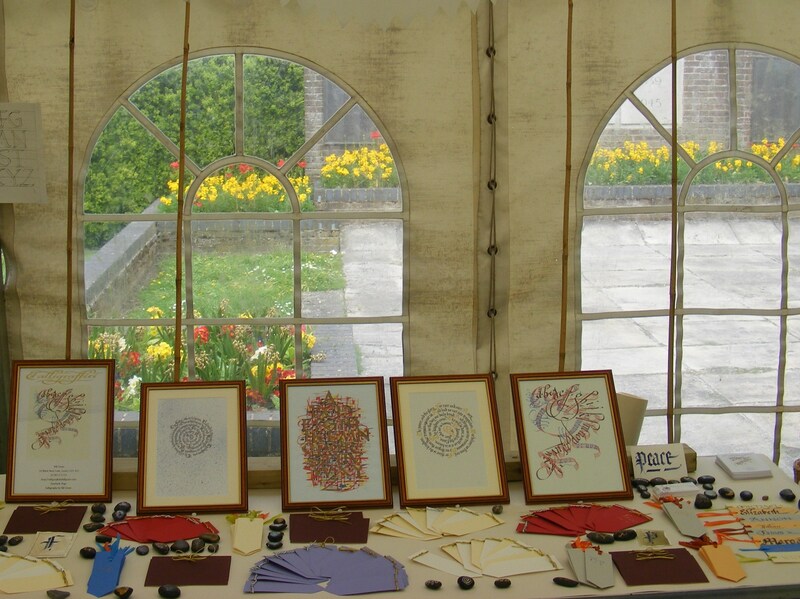 The idea was to have one table as a work bench, one for our wares, and another, spread with paper and scattered with double pencils and coloured felt tips, for anyone to try their hand at calligraphy. When I returned it was looking like this. Then after setting up my writing slope and trying out the pens and coloured inks, I found that due to the humidity, the colours were feathering on the card and though I could get some quite pretty effects, it was not a good representation of the lettering arts. Luckily I found that gold and silver worked quite well, so by the time our first customers appeared I had my mind made up for me that the metallic inks were the best alternative. Here I am with one of the first of many customers which became a steady stream throughout the day. Lady Gillian taking her shift. A break in proceedings while all visitors were watching the battles or the jousts, punctuated by the roar of cannon fire and the shouts of the combatants. These occurred at intervals during each day and were performed by the Medieval Siege Society. We were pleased to meet a number of the S0ciety members. 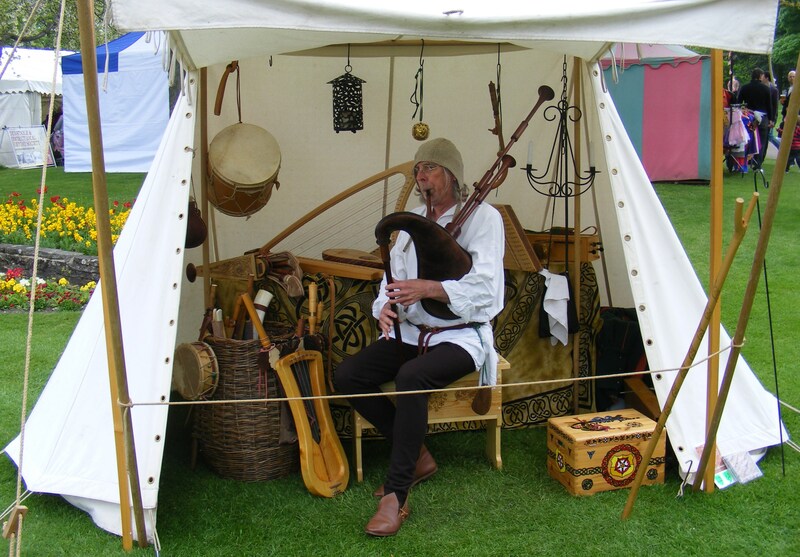 and finds Trevor James of Beccles playing an assortment of hand made medieval musical instruments. 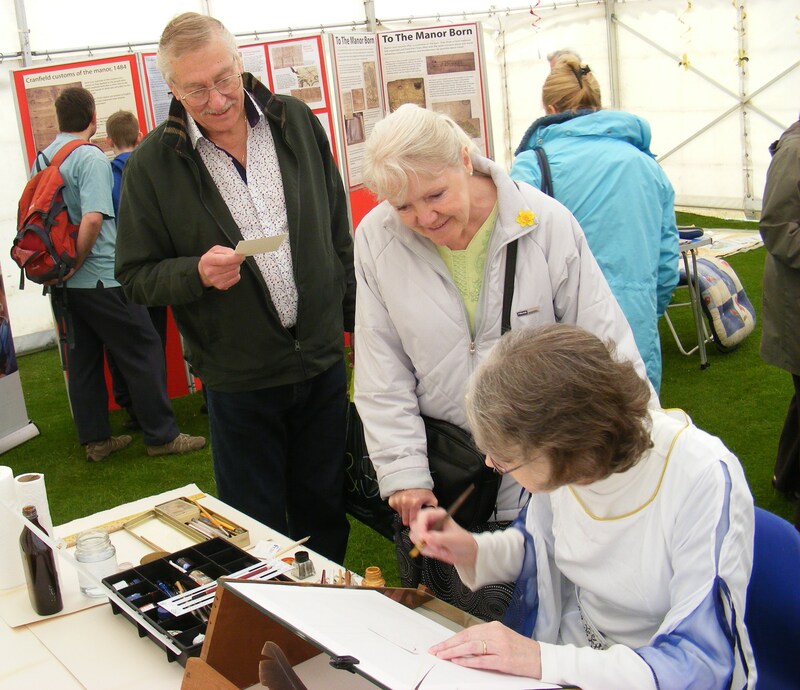 It was good to see so many people, both young and old, taking an interest in the calligraphy demonstrations and getting the hang of using double pencils. 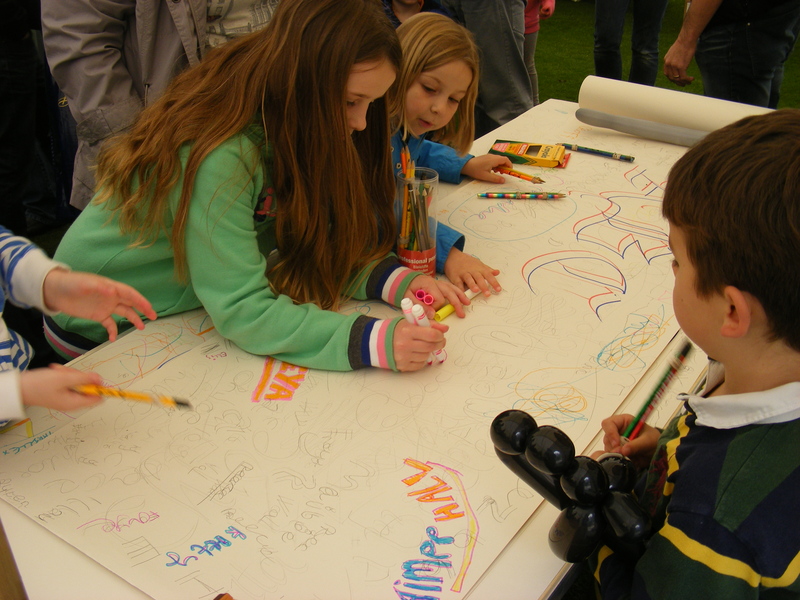 Over the two days we used about 30 metres of lining paper and only had to scrap one sheet, because it had been covered in obscenities by one youngster who had been told “Anything you like” in answer to his question, “What shall I put on here?” He then ran off laughing. Gill was very quick to remove the offending piece before it was noticed by anyone else. We used up all but one of the bookmarks and had only two or three wall-plates to take home with us. It was good also, that a few people liked the prints, both framed and unframed, enough to buy them. 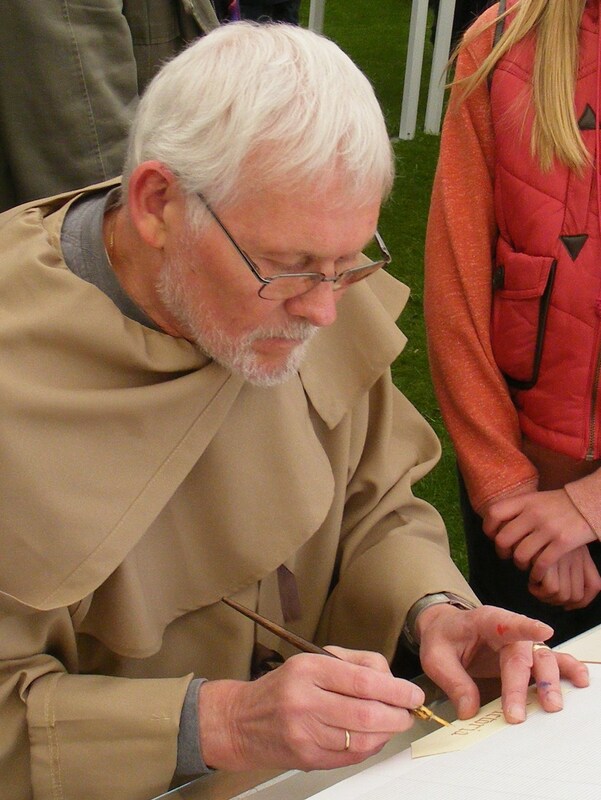 It was a joy for us both to work with these budding scribes, most of whom were eager to blow a little magic into the bottle, because it “made the pen work” and then watch it swirling around in the ink. Truth be told, watching their faces, the adults also thought this might be true. This young lady took lots of snaps. When I commented on her really tasty camera, she hugged it and laughed and said, “It is my baby”. I was pleased so many friends came to say hello. Some of whom we had lost contact with. It was really good to see you. Gill, a Dunstablian, was recognised by a neighbour she had not seen since childhood, and people she used to work alongside at the L&D hospital. Heheh! Fame at last. These two days have flown by. We have made another load of friends and contacts. There are promises of intended commissions, and invitations to similar events all over the country. The weather has been great in spite of the downpour the night before we arrived, and in spite of the “doom and gloom” forecast for the weekend. 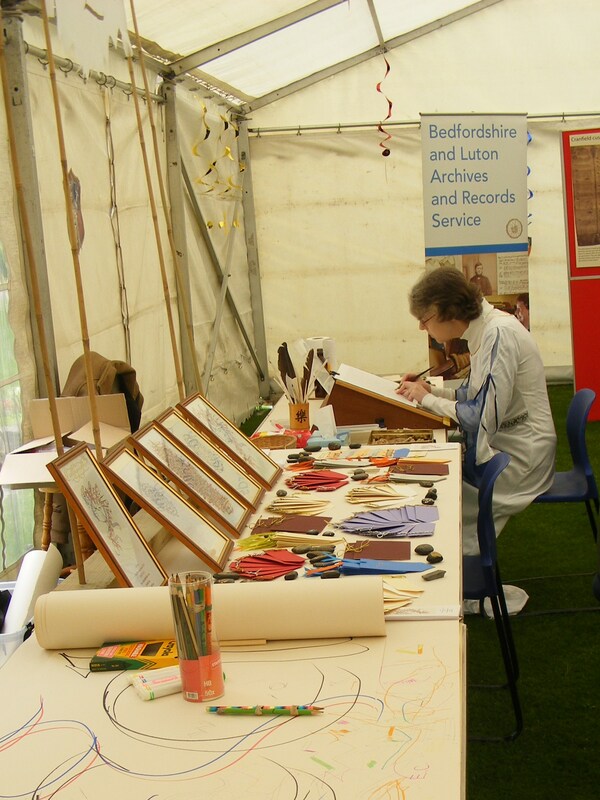 Many thanks to Jean Yates, the Project Officer, and Dunstable Town Council for inviting us. To the Army Cadets for brightening up a really gloomy start, all the cheerful faces of the St John’s Ambulance Brigade who came to see us throughout the weekend, (luckily, it seems there were no major incidents for them to deal with). And mostly to Lisa, the Event Organiser and her assistant, Lauren, for all you did for us before and during the event. You are a great team. Just a few yards from where we were working. 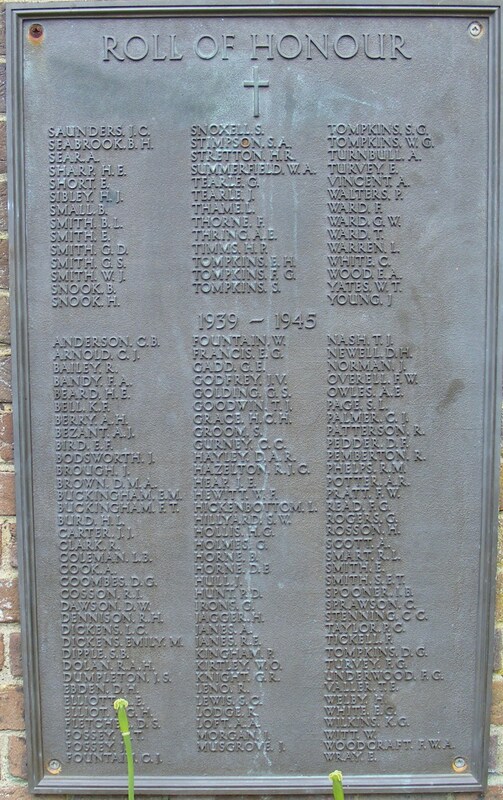 On the war memorial, Stenning, C.C. Gill’s uncle, who lied about his age to join the RAF. Became a rear gunner and was shot down, aged 18. RIP. Strangely enough, next year’s event, on the centenary of the 1st World War, will be remembering Dunstable during WW I. Those who know me well will have an idea of what or whom I shall be portraying, if, indeed, I am invited. 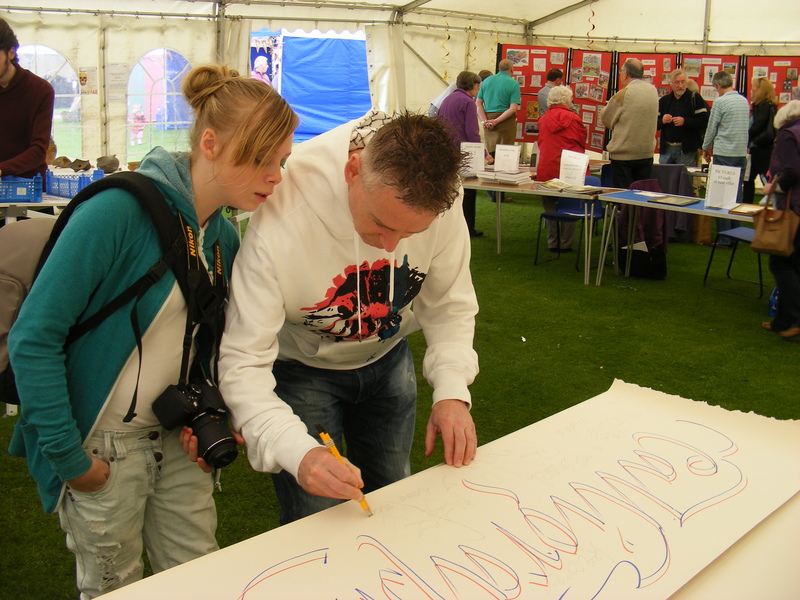 This entry was posted in Archaeology, Art, Beginners, CALLIGRAPHY,CALLIGRAFFITI,LETTERING,HOW TO, Medieval Dunstable. 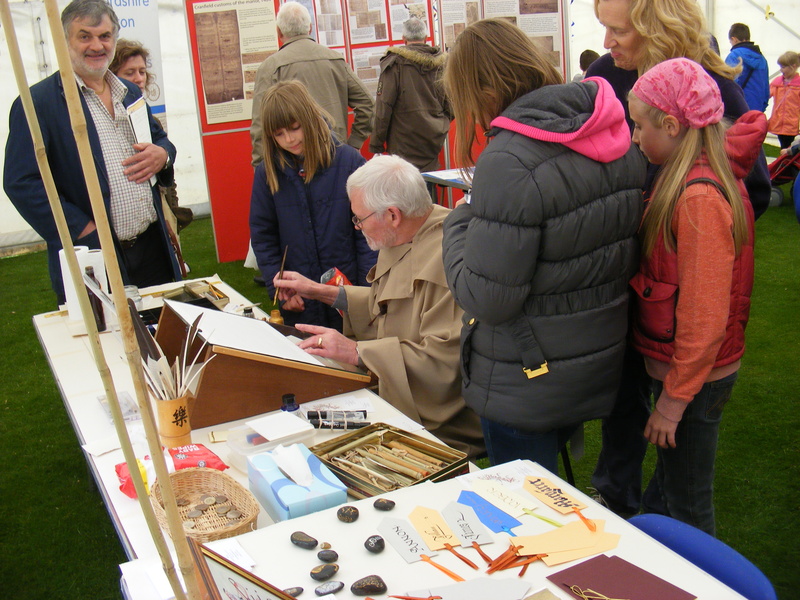 and tagged Archaeology, Art, Brother William, calligraphy, Dunstable., History, lettering, Medieval. Bookmark the permalink.